Located about an hour away from downtown Orlando, New Smyrna Beach is well-known to most locals. However, New Smyrna Beach has plenty more to offer couples than lazy days by the ocean. There’s a creative arts scene, rich history, and the culinary offerings grow daily with cuisines ranging from seafood to Italian fare. The city’s small-town charm and relaxed approach to life is evident, while still providing stimulating activities to enjoy. Whether you want to hit the ground running and experience all the must-do’s or prefer to spend your time lazing in the sun, this laid-back city is ideal for your next romantic getaway. One of the best things about a trip to New Smyrna is the chance to stay in a historic hotel such as The Riverview. Opened in 1885, this classic Victorian boutique hotel boasts 18 luxurious rooms for you to enjoy while you’re not visiting the beach or grabbing a bite. Take some time to relax by the pool or book a spa day just a few steps away from where you’ll be sleeping. If your goal during a getaway is to find peace and quiet, the Black Dolphin Inn will be your dream resting spot. The Inn is just minutes from the beach and operates as a boutique-style Bed and Breakfast. You’re in good hands as the owners, identical twins Scott & Brett Smith, have a combined 65+ years of experience working in the hospitality industry. A complimentary “Signature Breakfast” is offered including fresh fruits, fresh-squeezed Florida orange juice, yogurt, granola, cereals, homemade jellies and preserves, and assorted breads, along with a cooked-to-order hot item each morning. The Ponce Inlet Lighthouse is technically not located in New Smyrna. It is situated between New Smyrna and Daytona Beach. 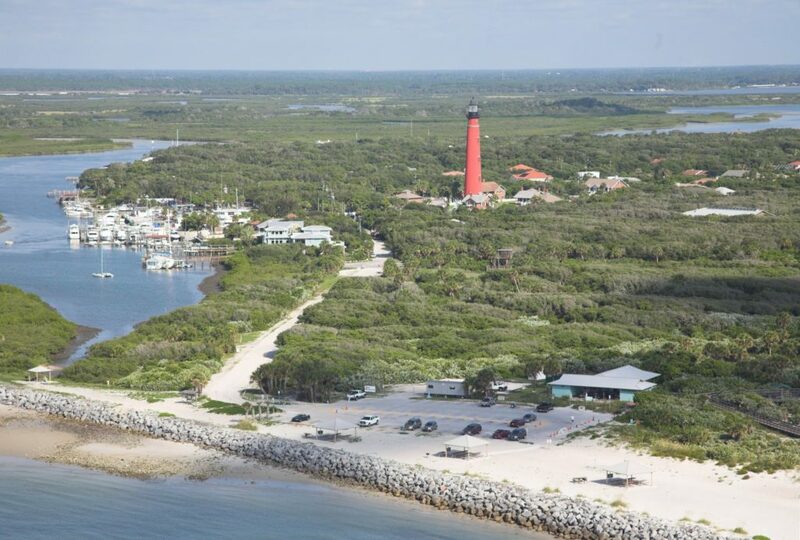 But a short 25 minute drive will lead you to this historic landmark taking the title of tallest lighthouse in Florida. Climb all 203 steps to the top to take in the view of Ponce Inlet and Daytona Beach from a height of 175 feet. Continue your adventure at the New Smyrna Beach Museum of History, which is appropriately housed in what used to be the local post office. 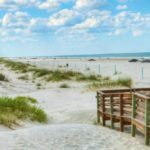 New Smyrna is celebrating its 250th anniversary in 2018, so if you’re a history buff you’ll be thrilled to learn about the rich history of this quaint beach town. And if you’re into surfing, they now house a surfing exhibit featuring several dozen world-class surfers who call New Smyrna Beach home when they’re not riding waves. Art lovers won’t want to miss The Hub on Canal, which allows more than 80 local artists display their work. In addition, they host regular artist talks and offer a variety of workshops and classes on topics ranging from art to wellness. Each month the Hub hosts a Gallery Walk from 4-7pm during the monthly First Saturday Art Stroll (more details on that below). One of only 3 drivable beaches in Florida, the white sands of New Smyrna Beach extend for 17 miles along the central Atlantic Coast. There are areas that are traffic-free, and there are several access points to enter the beach depending on if you prefer to park on the beach or not. You won’t have to leave your dog at home; head over to Smyrna Dunes Park where your leashed, four-legged friends are allowed on the beach. New Smyrna Beach is a favorite among surfers due to the abundant waves found in the ocean. The beach was even named one of the “10 Best Little Surf Towns in America” by Coastal Living. The Marine Discovery Center states their vision is “… to see a healthy Indian River Lagoon Estuary (IRL) and the ecosystem it supports preserved and enjoyed for its natural beauty, unmatched diversity of species and rich fishery for generations to come.” The facility hopes to obtain this by providing ongoing research, education and awareness of the fragility of this natural resource. Outdoor areas for learning and exploration include the butterfly garden, a public kayak launch and fishing site and an archery range. Indoors you’ll find the live aquariums housing a plethora of animals that reside in the Indian River Lagoon. The Marine Discovery Center also offers guided boat and kayak tours. A favorite is the two-hour Dolphin Discovery Boat Tour where you learn about the lagoon’s wildlife and spot sea turtles, dolphins, and manatees along the way. For an extra romantic date night, take the Sunset Boat Tour. The tour lasts two hours and takes you along the Indian River Lagoon while watching the sun set, complete with the Ponce Inlet Lighthouse as your backdrop. Admission to the center is free, however guided tours are extra. From beginner lessons to full tours and equipment rentals, you’ll find everything for an active nature date here. If you’re just starting out, a beginner paddleboarding lesson will be your speed while more experienced paddlers will enjoy the paddleboard surf lesson. You and your honey can see nature like never before by taking a paddleboard dolphin tour ($45/person). If you prefer to explore without a guide and are in need of a place to rent boards from, rentals are available up to a full day. The New Smyrna Speedway opened in 1967, and over 50 years later is still home to some of the most exciting stock car racing. Popular events hosted at the New Smyrna Speedway include the World Series of Asphalt Stock Car Racing in February and Florida Governor’s Cup in October. In addition to racing, the half-mile track has also been used as a prime testing facility for teams from NASCAR Nationwide. Admission is $10/person. First Saturday Art Stroll: Stroll down Canal Street and peruse the various antiques and art vendors. Every first Saturday from 10am-5pm. Canal Street Craft Beer Walk: Also held on the first Saturday of the month, tickets to the Craft Beer Walk are only $20 and provide you with 12 sampling tickets you can redeem to sample craft beer at 10 locations along the Canal Street Historic District. Canal Street Cruise In: If you love custom cars, visit on the second Saturday of the month for the East Coast Cruisers Car Show. Cars start filling up Canal Street around 3pm, so grab lunch and drinks and then enjoy the car show! For a refreshing treat after being in the sun and sand, hit up Mason Bar. Indulge your sweet tooth guilt-free with one of their cold pressed juices, acai bowls, smoothies or their fruity frozen pops in flavors like ​Strawberry Balsamic, Raspberry Basil and PB&J. Trying to stay on your diet while going a trip is almost impossible. You won’t stand a chance if you visit Yellow Dog Eats. This kitchen and bar is great for everyone on your trip as their menu includes sandwiches, great eats for the kids, pulled pork & BBQ entrees, and they even have vegetarian and vegan options. While you’ll see breakfast and pizza options on the menu, the REAL reason people go to Manzano’s Beachside Deli is for their sandwiches. Mixing Boar’s Head meat with the freshest of New York breads, you’ll understand why locals visit this beachside deli on a regular basis. Not in the mood to get dressed up and grab dinner? At Finger Lickin’ BBQ & Wings, you’ll find a casual atmosphere along with some of the best tasting BBQ on the Atlantic Coast of Florida. Get your order to go and take it to the beach, or dine on the patio as you prepare for a night downtown. Tacos are good. Ice cream is good. So why not get them both at the same place? Find both at Izzy’s Island Tacos & Ice Cream. You don’t even have to ask; yes, they have a $2 Tuesday special on tacos and beer. The title for the most beautiful outdoor eating and drinking space in New Smyrna Beach belongs hands down to Third Wave Cafe & Wine Bar. Their food menu consists of both savory and sweet options, sandwiches and Neapolitan pizzas. Red and white wines and cocktails are served from the full bar, and they can also make a mean latte. Authentic Tuscan cuisine in a romantic atmosphere by the ocean, what could be better? Dishes from the The Garlic‘s menu include Chargrilled Filet Mignon, Chilean Sea Bass Francese, and Spuntitori Italiano. Blu Bar offers some of the same staples from The Garlic with the addition of tapas. There is an extensive wine list to choose from, including American, South American, French, and of course Italian red wines. Enjoy nightly live entertainment nightly while you dine (check the calendar on the website for upcoming performances). Located off of Flagler Avenue and in a Miami Vice pink building, Breakers Restaurant boasts 17 burgers to choose from and a killer view of the beach. It will be hard to miss this New Smyrna gem. Ocean Breeze Tiki Bar also has a stunning view with a rooftop perfect for catching the sunset while the ocean breeze makes you forget about your 9 to 5. Check out our guide on how to Brunch then Beach for more beachfront eats and ideas. Whether you decide on drinking and dining inside the dimly-lit dining room or opt for the inviting outdoor patio, the ambiance at CorkScrew Bar & Grille is ideal for intimate conversation and a wonderful evening. Drink specials include $5 margaritas everyday from 11:30-7pm. The menu also includes seasonal cocktails, a generous wine selection and a decent beer list including local Florida drafts such as Sea Cow Milk Stout and Matanzas River Red. For those looking for a non-alcoholic tropical drink, there are $5 mocktails for your drinking pleasure. When you’re ready to find a hometown-brewed beer, you’ll be excited to know that New Smyrna Brewing Co. brews all of their speciality ales. Most are available all year with the exception of Chocolate Peanut Butter (Fall, Winter, & Spring) and Peach Blonde (Summer & Limited Batches). If you want to see how they brew all of their speciality beers you’ll want to hop on a tour. Half Wall Craft Beer Bar boasts over 100 bottled craft beers and 76 craft beers on tap. Not into beer? There are a variety of cocktails to wet your whistle, as well as several white and red wines. If you get hungry there is a generous food menu and daily drink specials.